The Sheriffs of Washington’s rural counties are increasingly pledging to not enforce the new gun control bill (I-1639) that was passed in November by ballot initiative, citing it as unconstitutional. 22 out of 39 counties make up the latest count, with more expected as the court battles ramp up across the state. When investigators looked into the person’s Facebook account, the user also commented on a news story about Grant County Sheriff Tom Jones refusing to enforce the new law. The person commented on the news story saying, “I am going to kill every single one of them,” referring to Republicans. . . Since that tragedy almost three years ago, Riverside County has had a very steady flow of applications coming in. So much so that Sheriff Stan Sniff hired more employees to handle the CCW backlog, which sat at a two-year await, as of this past April. A resident and five pro-gun groups have filed a lawsuit against Riverside County and Sheriff Sniff for his concealed carry license policy and practices that, the plaintiffs allege, are unconstitutional. Andrew Pollack’s daughter, Meadow, was killed during the shooting in Marjory Stoneman Douglas High School and he knows his daughter could be alive today if the sheriff’s deputy had acted. With the recent tragedy in Florida, I wanted to make clear my policy on responding to an active shooter. All commissioned Deputies, if you respond to an active shooter you are expected to take immediate action. We do not stage and wait for SWAT, we do not take cover in a parking lot, and we do not wait for another agency. We go in and do our duty. We go in to engage and stop the shooter and save lives. A measure challenging gun regulations is popping up around the state. Since 2015, four counties have passed a measure known as the Second Amendment Preservation ordinance, and commissioners in Malheur, Union and Lake counties have heard the same measure in the past few weeks. The ordinance is a reaction to the Oregon Firearms Safety Act, passed by the state Legislature in 2015, which requires background checks for transfers of firearms between private parties. These county ordinances allow sheriffs to ignore this law – which gun advocates see as unconstitutional. The Denver Sheriff Department has run afoul of the U.S. Department of Justice because it made U.S. citizenship a job requirement for its deputies during a hiring spree in 2015 and early 2016. The sheriff’s department will pay a $10,000 fine and will have to sort through old applications to identify people who were eliminated from consideration because they were not U.S. citizens, according to a news release from the justice department. When will the insanity end? Barrett Donates Rifles To Every Sheriff In Tenn.
(Sevierville, TN) At the Tennessee Sheriffs’ Association Annual Conference & Exhibition today, Barrett Firearms President Chris Barrett, shown photographed with Robertson County Sheriff Bill Holt, announced that his company is donating 95 Barrett REC7 DI rifles, one to each Tennessee county sheriff’s office or department. “When the Barrett story is told, folks usually talk about the civilian shooters and militaries around the world that have chosen Barrett long-range precision rifles for more than three decades. Less-often mentioned is my father’s background as a county sheriff’s deputy, our 5.56 carbines and rifles, and the countless law enforcement agencies that choose Barrett. We want to highlight that legacy and show our strong support for law enforcement by donating these Barrett REC7 DI rifles to the sheriffs in our state,” Mr. Barrett said during remarks at the conference. An Indiana sheriff vowed that he will not enforce any executive actions by President Obama requiring law enforcement officers to begin registering firearms. Elkhart County Sheriff Bradley D. Rogers made the remarks in a recent panel discussion on local TV station WNIT. “If President Obama today said, ‘I’m creating an executive order that all sheriffs and police chiefs around this nation need to start registering firearms,’ I will disregard it,” he said. The sheriff and at least one of his deputies have verbalized opinions that “constitutionalists” are threats to the sheriff’s office, the federal government, and to the country itself. Sheriff Knezovich even went so far as to compare “constitutionalists” with the Sunni Muslim terror group ISIS. The deputy indicated that the presence of armed “constitutionalists” in the county was the principal reason why the sheriff’s office was amassing military equipment. When asked to name names as to who he was referring to, Spokane County’s highest-ranking law enforcement officer (Sheriff Knezovich) named Washington State Representative Matt Shea and radio talk show host Alex Jones (who resides in Texas, not Spokane County, Washington). Add a historical and constitutional ignorance with a personal lust for power, and sheriffs and police chiefs across the country readily buy into the DHS propaganda. The result is men like Sheriff Knezovich and his deputy. 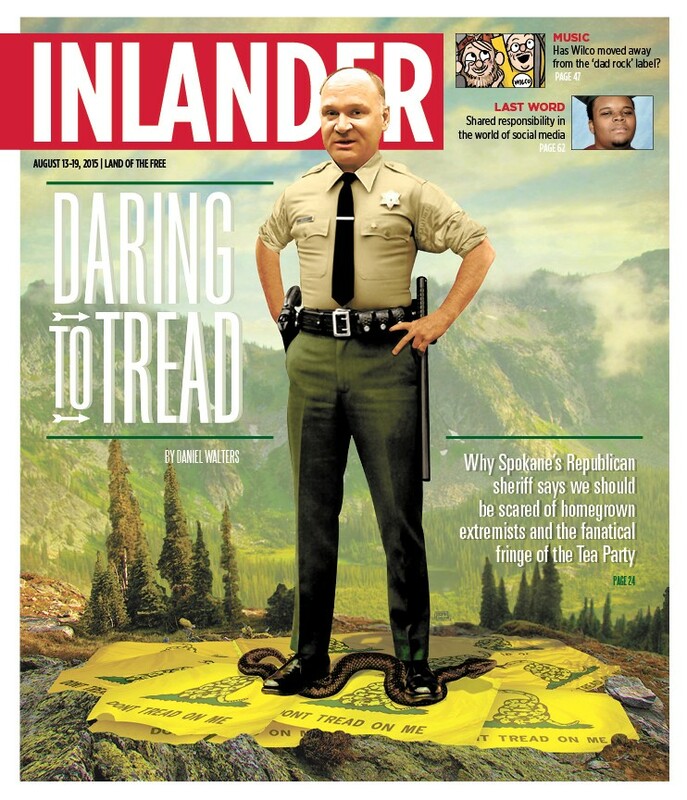 This week’s cover story has a lot of accusations being thrown around: It has Spokane County Sheriff Ozzie Knezovich warning that “folks that want to overthrow the government,” accusing a local state Rep. Matt Shea of “preaching hate and falsehood,” of getting elected based on fear. He doesn’t call Shea terrorist or a white supremacist, but he does warn that anti-government rhetoric could inspire anti-government violence. Three counties—Fulton, Albany, and Schenectady— were chosen in January to take part in the pilot program for pistol permit renewals. Five hundred “invitations,” as the state government dubbed them, are being sent to residents in each of the counties. “I’m asking everybody who gets these invitations to throw them into the garbage—that’s where they belong,” Fulton County Sheriff Thomas Lorey said at a meeting with Second Amendment supporters. Ares CEO is suing the San Diego Sheriff’s Department because he was banned from their Facebook page. to free speech in that space. Facebook is a private entity and therefore they can arbitrarily censor if they so choose. speakers in that designated public forum through arbitrary censorship. While backers of billionaire-funded Initiative 594 are planning one more rally this Saturday – using the Marysville-Pilchuck school shooting as something of a campaign prop – another county sheriff has joined 26 of his colleagues to oppose the measure, making the count more than two-thirds of the elected sheriffs against the measure. A majority of Washington State’s 39 sheriffs have come out in opposition to anti-gun Washington State Ballot Initiative 594. The sheriffs oppose I-594 because it will not make anyone safer, will strain scarce law enforcement resources, will criminalize the lawful behavior of millions of law-abiding gun owners in Washington and will be unenforceable. Instead, I-594 would vastly expand the state’s handgun registry and force law-abiding gun owners to pay fees and get the government’s permission to sell or even loan a firearm to a friend or family member.